Bumping locks is a serious problem in Toronto. In addition to our high security product line we recommend the installation of lock cylinders that are resistant to lock bumping. Bump keys can be used by any person with very little skill to bypass your standard locks and gain access to your home or business. The best way to protect your self from being bumped is to insure that all your exterior locks in your home are products that are resistant to bumping. Pre-Lock can provide you a security solution that will reduce the chances of this new phenomenon in Toronto. Anti-Bump™ locks and cylinders have special bump resistant pins to guard against lock bumping that is easily performed on standard locks using normal pins. The patent pending technology inside Anti-Bump cylinders resists the transfer of force from a bump key to the pins, eliminating the bumping risk normally associated with standard lock cylinders. 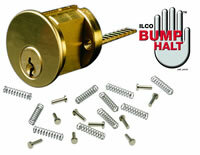 Bump Halt provides a “bump resistant” solution for the Ilco line of Key in knob/Key in Deadbolt, Mortise and Rim Cylinders. This Innovative Patent Pending solution to bumping will resist the transfer of force from the bump key to the pins. Kits are also available that will enable conversion of a new or existing Ilco Cylinder. • Conversion kits contain 10 pins, 10 springs and instructions (one pin and one spring will resist bumping; add an additional pin and spring to increase the security. Upgrade your cylidners to be bump resistant today!